What's so special about the numbers 10 and 12? In addition to their many other characteristics, the first just happens to be the number of consecutive years that Jeanne Maxon earned the title of Ocean Ridge Ladies Club Champion (1999 - 2008). 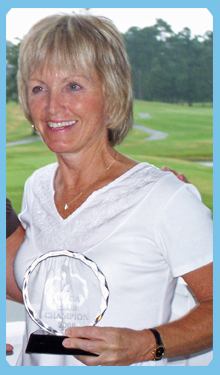 In addition, Jeanne earned the title again in 2010 and 2011 bringing her total to 12 Club Championship wins. Just try to find an LPGA professional who has won as many as ten consecutive tournaments at the same venue or 12 non-consecutive tournaments. Laura Davies (1994 - 97 Standard Register Ping) won 4 in a row. However, the longest winning streak ever recorded in the history of golf (seventeen tournament events in a row) is held by Babe Didrickson Saharias whose streak came to an end in 1947. By the way, in 1949, Babe and another golfer, Patty Berg drew up the charter for the Ladies Professional Golf Association (LPGA) and Berg volunteered to become the group's first president. Getting back to Jeanne, what does it take to achieve this amazing feat? Besides the natural ability she brings to the game, anyone will tell you about the number of hours over the years that she has spent practicing golf skills and taking lessons to fine tune her game. She continues to evaluate the good and bad of her game, often writing notes during play, and then seeking advice on how to improve. If she has struggled through the first round of a tournament, you can put money down that she will be on the driving range or the putting greens trying to work out the kinks. On the course, she is competitive to the last hole. Just ask Grace Bradicich who lost to Jeanne on the 18th hole during one of Jeanne’s earliest championship tournaments. Even when shots stray from their intended targets, she manages to keep her cool, stay focused, and get the job done. For every golf hole there is the easy way and the hard way. If you have had the opportunity to play with Jeanne when she sports her “A” game or see her at her best, you begin to understand what it means to play the hole the easy way. When she falls behind other competitors in a round or tournament, she draws on the sheer determination and the fighting spirit necessary to get back in the game. When it comes to crunch time and she needs to sink a putt, you can see the concentration in her eyes, you can hear her whistle a tune to loosen the tension, and more often than not, you will find yourself congratulating her for her clutch putting. In addition, she recognizes that golf is a game and her humorous one-liners after a frustrating situation in a competition lightens the moment for everyone playing with her. After the round is played, she is the same gracious lady whether she lost the round or won the tournament. Rather than speak about herself through all her victories over the years, she will describe the great shots made by her competitors during the tournament. Jeanne will tell you, smiling all the while, that her motivation to win is being awarded the “Club Champion Parking Space” close to the club house. We all know better. Above all else, she has a “love for the game” that is the heart and soul of her retaining the Ocean Ridge Ladies Club Championship title for 10 consecutive years.